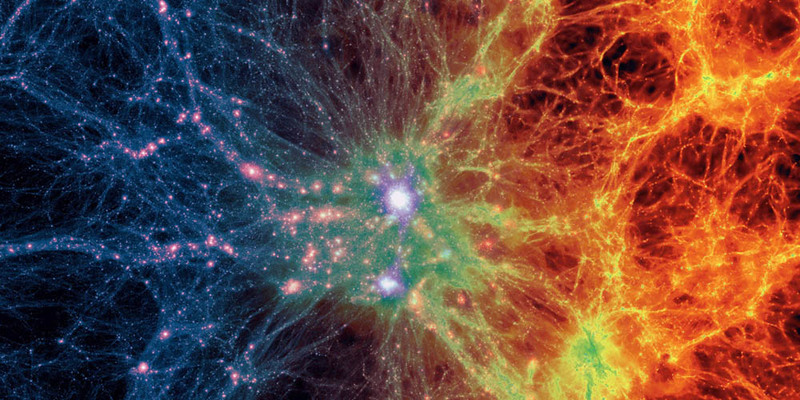 University of Zurich (UZH) researchers have simulated the way our Universe formed by creating the largest virtual universe with a large supercomputer. The team turned 2 trillion digital particles into around 25 billion virtual galaxies that together make up this virtual universe and galaxy catalogue. The catalogue will be used on the Euclid satellite, to be launched in 2020 to explore the nature of dark energy and dark matter, to calibrate the experiments. “The nature of dark energy remains one of the main unsolved puzzles in modern science,” UZH professor of computational astrophysics Romain Teyssier said in a press release. Euclid will not be able to view dark matter or dark energy directly; the satellite will instead measure the tiny distortions of light of distant galaxies by invisible mass distributed in the foreground—dark matter. “That is comparable to the distortion of light by a somewhat uneven glass pane,” UZH Institute for Computational Science researcher Joachim Stadel said in the release. The precise calculations that have allowed the team to create the virtual universe have also allowed them to simulate small concentrations of matter, dark matter halos, which may be the loci in which galaxies like ours form. The Euclid’s mission is to explore the dark side of the Universe, so part of the challenge of the virtual universe project was to accurately model galaxies only one-tenth the size of the Milky Way, within a massive volume the size of the observable Universe. The behavior observed in the virtual model will help Euclid know what to look for on its journey. “Euclid will perform a tomographic map of our Universe, tracing back in time more than 10-billion-year of evolution in the cosmos,” Stadel said in the release. Researchers hope to learn more about dark energy from the Euclid data, but they are also eager to discover new areas of physics beyond the standard model, such as a new type of particle or a modified version of general relativity. Each bit of evidence along this journey may well take us one step closer to understanding the origins of our galaxy, and perhaps the entire Universe.